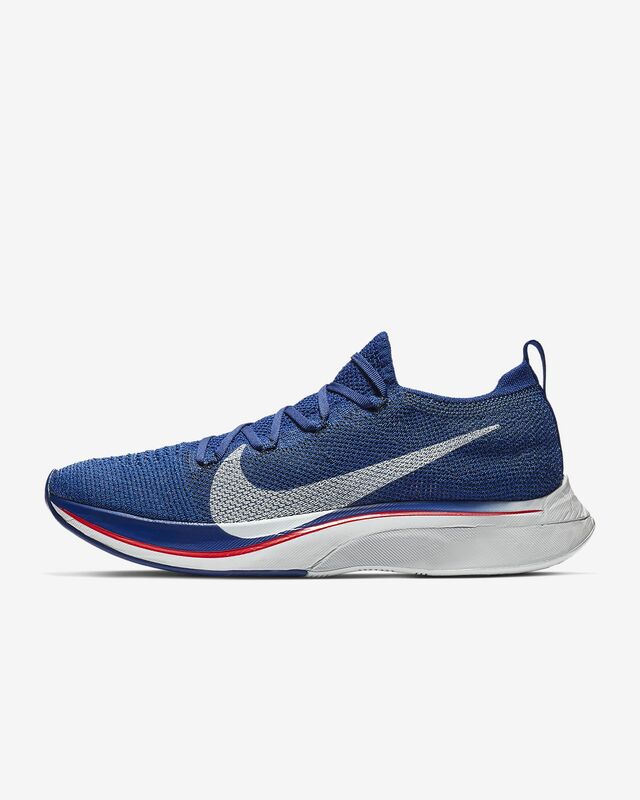 Built to meet the exacting needs of world-class marathoners, the Nike Vaporfly 4% Flyknit is designed for record-breaking speed. The Flyknit upper delivers breathable support, while the responsive foam and full-length plate provide incredible energy return for all 26.2. Flyknit-constructed upper provides lightweight breathability and support. ZoomX foam is ultralight and responsive. Full-length carbon-fibre plate feels like it&apos;s propelling you forwards. Internal heel design secures the back of your foot. Since its debut in the summer of 2017, the Nike Zoom Vaporfly 4% has seen its share of medal stands. That includes New York, where Shalane Flanagan (2:26:53) and Geoffrey Kamworor (2:10:53) both won in the shoe. Five of the six podium finishers in Boston wore it, and Galen Rupp had a pair on when he became the first American in 15 years to win the Chicago Marathon. Flanagan puts it simply: "This shoe is a game-changer". 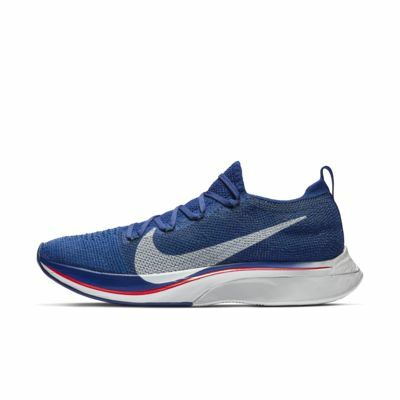 Science backs this up, as the Nike Zoom Vaporfly 4% is the most efficient marathon shoe Nike has ever sold. In lab tests, it measured roughly 4% better for running economy than Nike&apos;s latest and fastest marathon racer, the Zoom Streak 6. So it&apos;s the fast. But how does it feel? "I&apos;ve been known to have &apos;diva&apos; feet", Flanagan says, "but when I first tried the Zoom Vaporfly 4%, it was love at first run". I've never found a perfect shoe, but these are one of the best. I go faster. I ran about 100 miles before they started to noticeably deteriorate. They didn't deteriorate by coming apart at the seams, they just lost their spring. Thanks Nike. I have to give it to Nike, I love these shoes. I was skeptical when I ordered them, especially at this price. I can honestly write that these are the best pair of running shoes I have ever owned. I do think the only downside is they don't last as long as I would have liked, but I am going for my second pair soon. No breaking in to worry on. I realize every person has different needs with running shoes, to me these are the best out there. Great job Nike.